John J. Mooney, 23, a Southern Pacific machinist who recently arrived from Butte, Mont., was aboard the West 2nd Street car on his way to be initiated in the Modern Woodmen of America when the brakes failed, sending the car into the southbound Spring Street trolley, killing him and injuring seven other passengers. 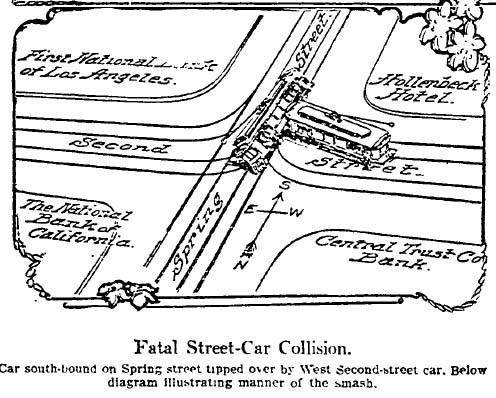 The intersection is known as a danger point because of the steep hill on 2nd Street, according to The Times, which noted that another fatal accident occurred there Dec. 24, 1905. Officials say the 2nd Street car stopped at Broadway, then proceeded toward Spring when the brakes failed. The motorman of the Spring Street car accelerated to avoid the oncoming trolley but couldn’t get out of the way. According to one of the motormen, the Spring Street car teetered for a moment after the impact and then overturned, crushing Mooney’s head and chest as he tried to crawl out of the trolley. The Times reported that the 2nd Street car had braked to avoid a black cat running across the tracks around Westlake Park, which some passengers took to be an omen. 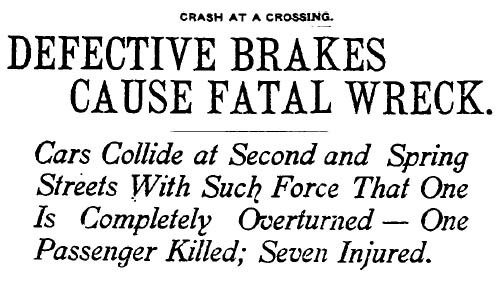 Curiously enough, The Times did not relate this crash to the other accidents involving rails greased by Halloween pranksters. One might wonder whether the brakes truly failed. Note the map: The Central Trust Co. has been replaced by The Times Building and the First National Bank has been replaced by the Recycler Building, now wrapped in ads for the Jeep Wrangler. The southwest corner, where the Hollenbeck Hotel once stood, is a parking lot. The new LAPD headquarters will be built on the northeast corner, formerly occupied by the Caltrans building.